Some preliminary good news for Carmageddon: as of 8:15 a.m. Monday morning, the National Weather Service is predicting decent weather for this weekend in the San Fernando Valley. 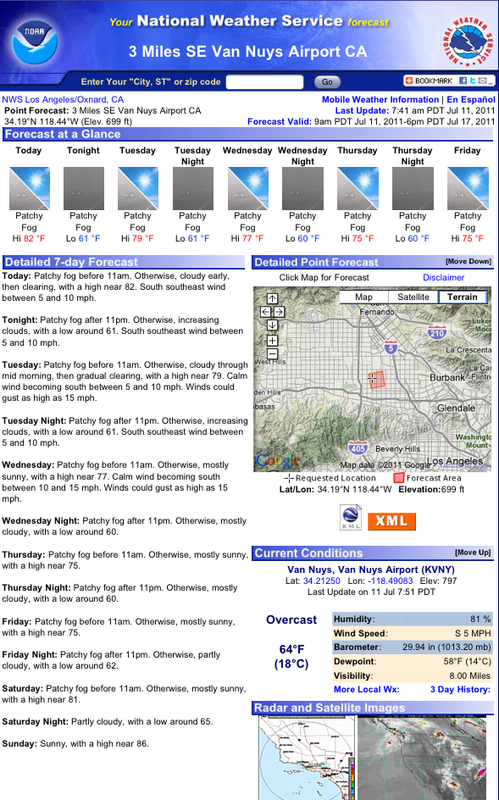 See the forecast above, taken from the NWS website. If the forecast holds, it will certainly help not to have blazing hot summer temps in the inland valleys, since getting to the beaches in the L.A. area likely will be a royal pain due to traffic. In case you just emerged from an Antarctic ice cave, the 405 is being shutdown from late Friday night until early Monday morning to partially tear down the Mulholland Bridge. That, in turn, is being done to add a northbound carpool lane on the 405 between the 10 and 101 freeways and make other serious upgrades to on- and off-ramps along that stretch of the 405. The mantra for this weekend traffic-wise is for motorists to plan ahead, avoid the area around the 405 and/or stay home. That said, for those in the San Fernando and San Gabriel Valleys that absolutely insist on going to the beach, I suggest avoiding the L.A. Basin and consider hitting the sand in Oxnard or any points north. There are train options to avoid driving, although tickets aren’t cheap. Amtrak stations in Ventura, Carpinteria and Santa Barbara are a short walk to the beach. Here’s the schedule for Amtrak’s Pacific Surfliner train. Residents of the Inland Empire also have the option of taking Metrolink to the beach in San Clemente. Here’s the weekend schedule for the Inland Empire-Orange County line. Whether Amtrak is expensive depends on (a) whether you believe AAA’s estimate of operating a car (51 cents per mile) and (b) how many people are traveling. Union Station to San Clemente is about 65 miles one way and costs a maximum of $22 (cheaper if you’re an AAA member, senior or other categories). If you’re a solo driver, Amtrak represents a 50% (or more) savings. Surfliner is cheap compared to driving! Updated 2010 AAA driving estimates – plus you don’t have to pay $parking at Carpinteria. I noticed that fares on the surfliner are more expensive right now during the summer and are rather expensive in general. 14 dollars just from union station to Anaheim and 36 dollars to San Diego when its only 21 dollars to drive there! That’s based on my car on the AAA estimate. Personally I will use the surfliner when I can as I see it preferable to driving and less stressful. But most people going to those places whether its Disneyland or San Diego, will almost certainly drive with that high price. Unless the surfliner lowers its fares to that of a typical commuter rail line (which the surfliner basically is) or electrifies and goes 110 or higher mph, ridership is not going to increase much. If a group of people travel its even more expensive because its that fare times everyone in the group. At that point going in a car is just more economical for most people. The surfliner is a decent commuter/intercity rail line for US standards but it really needs serious capital improvements to be more attractive as an alternative to driving. Higher speeds and lower fares are both needed. The last four items are costs of ownership and have no relation to the cost of driving. You will pay them whether you drive, take the train, or stay home and milk the cows. I strolled out of my Antarctic ice cave this morning only to see deserted streets. The Big Fear really worked. Those over-priced vendors at the beach will be lucky enough to sell a bag of peanuts.